I haven’t written anything in nearly three weeks, since our cat was taken ill and subsequently put to sleep, so I figured I’d write a little bit about Fitzgerald here and see if it helps me resume the tenuous writing habit I’d so carefully built up over the last six months. They told us he was nine weeks old and I laughed in their faces. My first job was at a pet store and to my “trained” eyes, Fitz was at least four months old. He was huge. 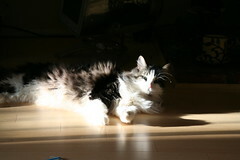 I’d never heard of the Ragdoll breed and it would be a year before we figured out that was what he was. I figured for awhile he was mostly Josh’s cat except I took care of him, laying with him on the couch at night when he cried to be allowed in the bedroom, feeding him. He would jump into my lap when I sat at my desk and lay on his back so I could rub his belly. He smacked his head every time he did that, so I started keeping an eye out for him, and when he showed up next to my desk I’d just lean down and pick him up before he could brain himself. I have a distinct memory of Josh and Fitz laying on the couch napping one afternoon that first summer, both laying in exactly the same position, Josh with his arm over his eyes and Fitz with his paw up over his own eyes. I always wished I had a camera for that, so I made a point of remembering it. He learned that we would leave our respective rooms at the same time every night to watch the Simpsons, so when the theme song came on at 7 he would come to each of our rooms and meow until we followed him, then he’d sit between us and watch. Through the years, The Simpsons was the only show I ever caught him paying attention to on a screen. Once he tried chasing the race cars on the screen when we watched an Indy car race, but he was too smart to do it twice once he figured out they weren’t going to come out from behind the TV. He liked to sneak sips of water from everyone’s glasses. He chewed on every cord in the house until we poured hot sauce all over them, and recently Josh realized the ancient mouse he was using still had hot sauce on it from our kitten deterrent period. I can keep this up all night, we had him for eleven years. He went across the country with us twice. He played like a kitten with his toys until the very end of his life. I will forever be grateful to my mother that for the last three years he had a huge backyard with loads of trees that were all his own, it was something I always wanted him to have and it felt like an achievement to give that to him – sounds silly to say about a cat, but he truly detested life in our 2nd story Kansas City apartment, even going so far as to jump from the balcony to the roof, checking out the other apartments, until he jumped back to our balcony from the one next door. He was closely supervised on the balcony after that. He held his own in his few spats with the grey neighborhood kitty that snuck into the backyard occasionally. The raccoons were afraid of him, and he was afraid of them. He loved the taste of butter and the scent of carrots, and while he didn’t deign to lay on anyone’s lap too often, when he did it was either because the house was cold or because he sensed we were ill or upset. Josh doesn’t have the best hearing, so when he gets excited about something he sometimes raises his voice – Fitz always meowed at him to keep it down. He was very talkative, and we joked that he was so close to being able to say my nickname “Anna” that we may as well just do whatever he said, since he was learning English faster than we were learning Cat.